I'm not sure I know where exactly to start with the topic of portable turntables, all-in-one turntables, or turntables with built in speakers... whatever you want to call them. We write about turntables a lot, I know. My point with making a list of the 10 best portable turntables or the 5 best all-in-one record players is this: There are a lot of really good options if you know where to look. There can sometimes be a pretty big barrier for people who are trying to get into collecting vinyl. I get it, you can't just go out and buy a Bose SoundLink or other such similar streaming device and just plug it in and magically listen to your records. A lot of "die-hard" record collectors insist that the only way to reallllly enjoy vinyl is to have a stereo that is pretty elaborate and tower-speakers with a special receiver and all of that stuff. Actually, we're modestly like that... because a good stereo is something I think everyone who loves music should invest in. But if you're just getting started, or just want to feel it out before you dive in head-first into a new hobby, a fantastic place to start is one of these all in one turntables. I say that because even with the higher end stereo setup I currently have in my living room, I love the simplicity of a small standalone record player that I can listen to in my loft. If you're buying a turntable for a friend or whoever and just aren't sure if they'll be let down by a more entry-level turntable, consider the idea that even if they plan on upgrading to a much nicer setup in the future, just about everybody who ends up loving the practice of collecting vinyl in the future will appreciate the idea of also having another small turntable that sits by itself and plays records in the bedroom or near their office desk. My first turntable was a portable one, and even though I almost never move it anywhere in my house or take it anywhere really, it is nice to just have it... even knowing I have the mother-of-all-stereos elsewhere in the house. So, I've put together this list of some record players that I think have some classic styling, basic-functionality you should expect, and that I think would make the perfect starter turntable for anybody. If you are unsure about going any further into record collecting or just want to be able to listen to your records in a different room in your house without having to buy an entire new system, I think this is a good place to start. One of the newest all-in-one setups available, this system is complete with built-in bluetooth streaming (making it infinitely more useful outside of your LP interests by playing music from your iPhone/iPad or anything else with bluetooth), detached speakers, auto-returning tone arm (when side of record is finished) and classic styling. It plays records at 33 1/3, 45, and 78 RPMs as well as CDs from a front loading tray. With more powerful speakers than other all-in-one options, the ability to distance the two-way speakers from the base unit itself will do great to stifle vibration and surface noise on your record from the speakers playing the sounds themselves. A truly great option if you want everything in a record player in one purchase. I like this record player because of the classic horn-style design. Most people will probably not get much use out of the extras if you're buying for the record player aspect and horn-design specifically, but some people are very specifically looking for them. The extra playing speed (78rpm is available on this one along with common 33/45 RPM speeds), AM/FM tuner, front panel aux-in jack, and drawer CD player... all bundled with the bright horn make this a good option if you like the design. Portable-style turntable with stand. Plays at 33/45 RPM with AUX input--Iconic style with modern function. Full range front facing speaker plays better than most portable options in a large room. I love this cabinet-style, all-in-one turntable. It's beautiful, and completely functional as a record player with speakers built in. It has AM/FM radio, the turntable is hidden under the cabinet lid so you can display things on it when it's not being actively used, it has a fully functional CD player, and plays records at 33/45/78 rpm speeds. Only real potential drawback is that it weighs in at over 50 lbs... which might deter some interested buyers. With this turntable we start to get into the more portable all-in-one record players. A little less ornamental, way less heavy, and overall just more concise packages altogether. 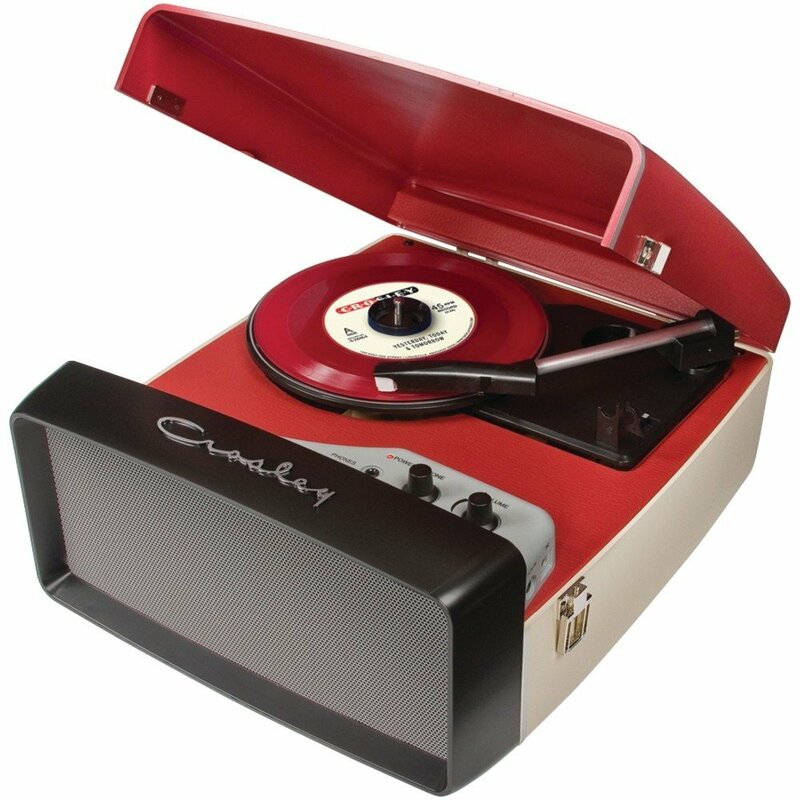 The Crosley Memory Master II has a record player, built in tape player, and CD player and boasts the ability to record from either tape or record to CD. 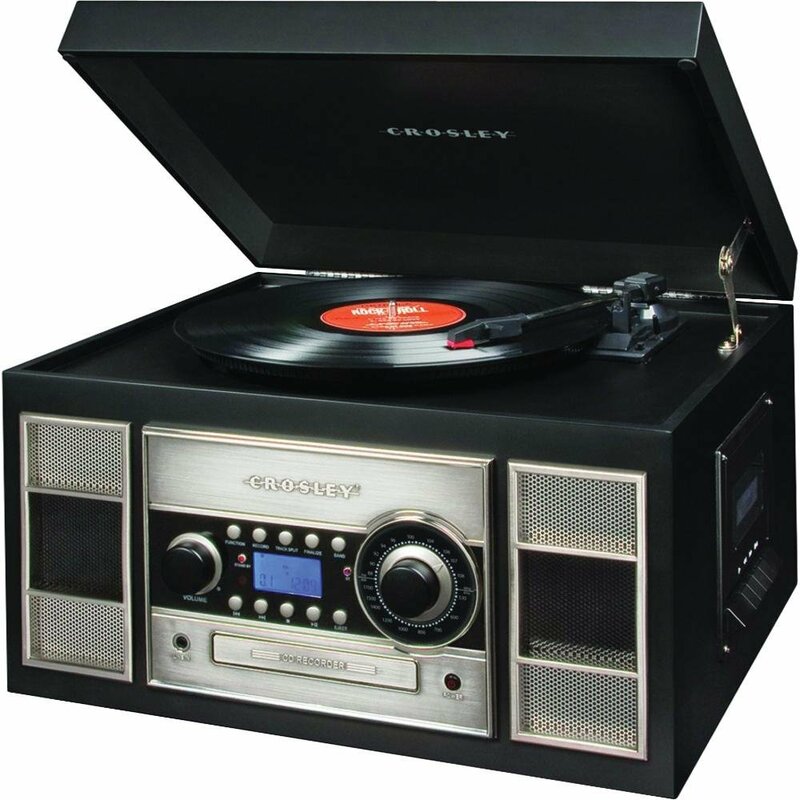 It is USB enabled and has a fully functional remote control, plays records at 33/45/78 rpms, AM/FM tuner, auxillary input/output, and weighs less than 21 lbs. Overally, a very high quality, functional record player for anyone... with a lot of great options. Another great stand-alone record player, this retro designed Electrohome Signature Hi-Fi stereo system is an excellent complete system. 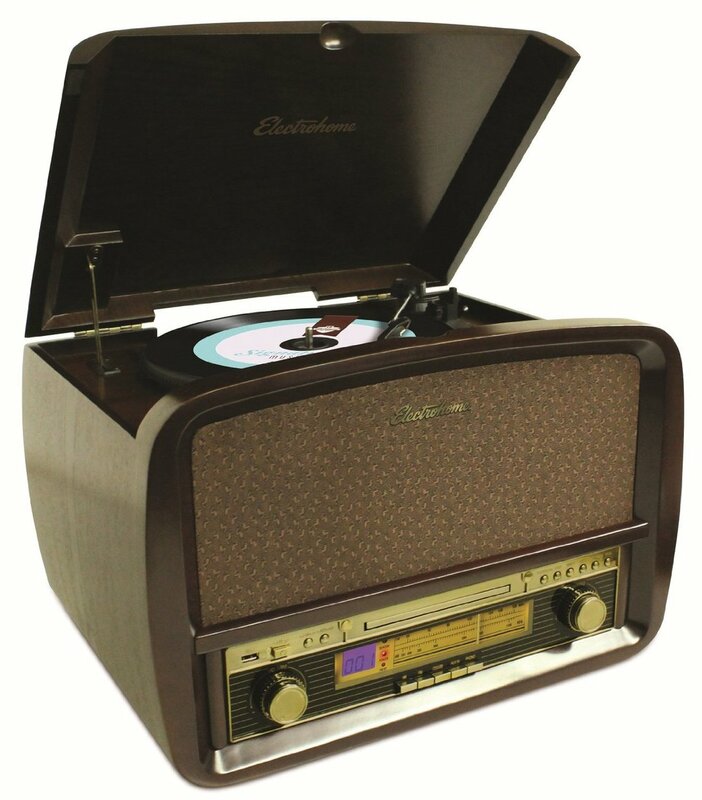 It has AM/FM radio, CD player, plays mp3s via USB or aux input, has a woodgrain finish, and can record your records to mp3 if you're looking for that option, and plays records at 33/45/78 rpm. The following turntables are ones that I think are more specifically great portable all-in-one turntables. 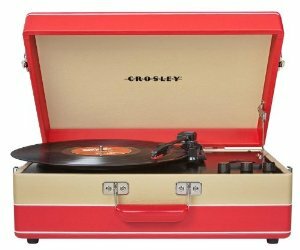 You'll see Crosley brand a little more than any other, they have the most options for color and style choices and have just been in the game getting better and better every year. The key features will be listed with each option, but with these it's mostly about color/style you prefer and less about the differentiating features of each one. You'll find most of them are very similar... but I'll try to point out important things to note with each one. The important thing to note with this one is that the speakers are near the rear of the turntable. For some people that will be a bother because if you're going to keep it in a certain spaces, it might not send out the sound as you'd like as compared to the next one. 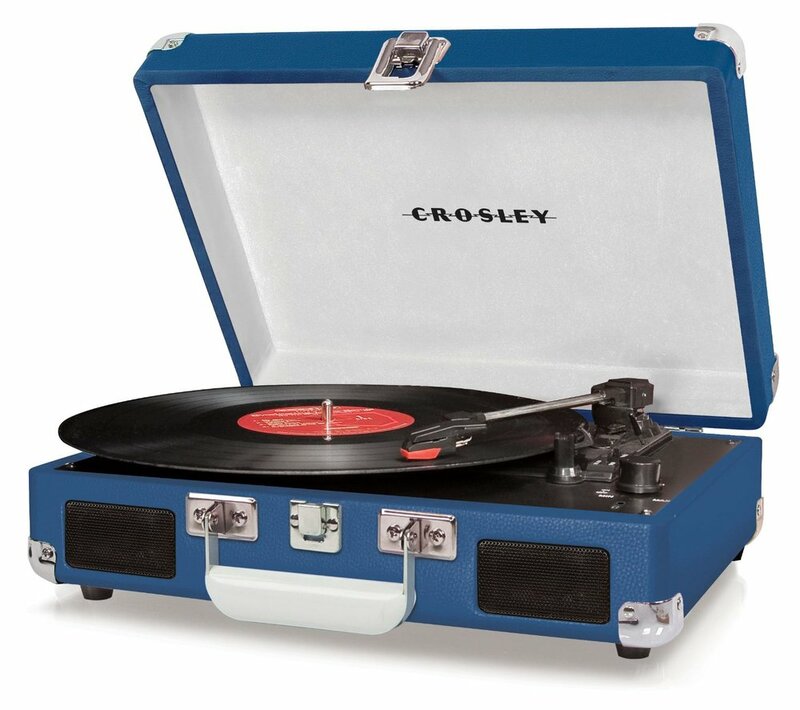 Asthetically, this is my favorite of all the Crosley portable turntables. I like this one because it has forward facing speakers for a more direct sound. To each their own, but I think with the color choices, direct sound, and no am/fm radio... this is probably the perfect little portable turntable for people who are looking to specifically do JUST that... listen to records. You might notice this little guy is a mini portable turntable. It's a cool, direct sound, no frills turntable, that carries from the short edge... but I'm not sure I prefer it over the previous option based on it's extremely miniature size. I like this one a lot, but mainly for the styling and design. It looks like it could be sold by Jack White at Third Man Records. With the big front facing speaker design, I think it's a great option. A simple and great portable record player that just plays records, which is my overall preference. Although this one has indirect speakers, it is an overall larger unit than some of the previous ones I listed so there is more power and the speakers themselves are just bigger. The sound from a portable turntable like this is excellent. For someone looking for an alternative to the Crosley brand of portable turntables, this one is a very similar design with direct, forward-facing speakers that can get the job done. Find turntables by price over here.